"Crochet with Dee, beautiful items!" and find out why spiders weave webs "Why do Spiders Weave Webs?" "Roll up that yoga mat & Get out your Hook" from "Crochet Me online magazine"
"I crochet, therefore, I am"
"the Knitty Store" I know it says Knit, but check out the clock and the yarn stash items! "My stash is bigger than your stash"
I own a sweatshirt that says Yarn Junkie, but if you're braver, check out the Yarn Ho shirts "Yarn Ho shirts"
I love this purple scrumbles mug "Purple scrumbles mug"
Here's another great mug "Yarn mug"
Declare yourself the Stash Queen "Stash Queen items"
"The Official Shopping for Yarn Online Mousepad"
Show the world your real addiction "Addiction shirt"
We all know there's too many yarn choices out there (too many, am I crazy?) "So Much Yarn, So Little Time" The basket of yarn does have a knitting needle stuck in it, why can't they at least give crocheters equal time and show hooks and needles! Love the sentiment of this shirt "Love in all the Stitches"
"article The Joy of Swatching"
"article Build your own Stitch Dictionary"
I've worked out the design in Tunisian for the Purple afghan. I've even got a great border, classic crochet, that's the hard part for me. I've been online all day trying to locate an inexpensive source for Read Heart Super Saver. Thought I had a good price at Hancock, $1.90 for an 8 oz skein, but add on shipping and it's not so different from the local price of $2.17. Now where did I locate that Homespun at $2.99/skein? They should have a good price on the Super Saver. I know,...we should have bought a 4 bedroom house. Today I was introduced to a new site that has tutorial videos on Tunisian stitches. It is called Nexstitch, check it out here "Nexstitch site" . I saw a new stitch called the corded stitch, so I was sitting at the computer watching a stitch tutorial and working with yarn & hook at the same time. I liked the stitch, so made a sample block to go in my sampler afghan. With all the other projects, I've neglected this after a really fast start. 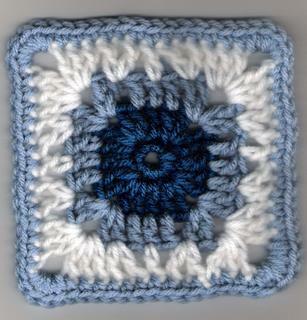 The Yahoo group Tunisian Crochet started learning a "stitch a week". At the beginning of each month the coordinator would send us a stitch for each week in that month. We could work a stitch a week, or faster or slower, as we wanted. We each purchased our own reference book, or worked from the site's files. Books used include the 52 Tunisian Stitches combine to Make an Afghan Stitch Sampler (Leisure Arts Leaflet #2501 52 T.C.St), 101 Easy Tunisian Stitches (Annies Attic #874612 101 E.T.St. 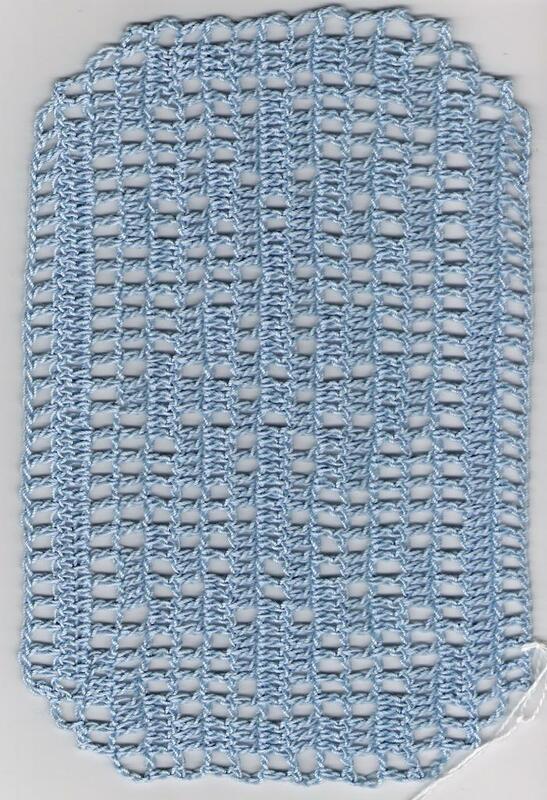 ), and 101 Double-Ended Hook Stitches, (Annies Attic #873612 101 Double). "Tunisian items at Annie's Attic"
I had decided to coordinate the colors I used to make my blocks, and eventually combine them to make an afghan, so I chose colors that would go in my living room and worsted weight yarn, and baby colors in sport weight...might as well make two sampler afghans. 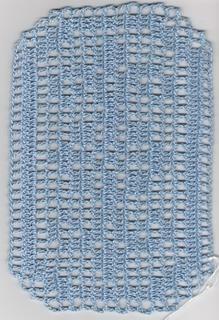 After making the block of the corded stitch, I decided to see what stitches in the 101 booklet I would like to make. While working on blocks for the sampler afghan I was also thinking about what might work up nicely for the "purple afghan". # 34 is a shell-like pattern, interesting, but not a whole afghan in one color in this one stitch. # 19 is worked in 2 colors, I really like this, it looks good in frost green and soft white. I think it would look nice in amethyst and bright white. What I like about all three stitches is that they look nice on the back, not identical to the front, but definitely nice looking. Some Tunisian stitches look great on the front, not good on the back, your work has a definite "right" and "wrong" or front and back. Not so with these stitches, in fact the two color looks better on the "back" to me. You can throw this on the back of your couch and not worry about people seeing the other side of your work! I think I'll work up a sample of the purple and white and see how I like it. Last night I worked up a sample of a simple ripple with the amethyst, and for the return row I used white. It makes a row of chain stitch, like small arrowheads through the dark yarn. I like the look, so I've got several swatches to think about for this afghan. It's time to start thinking of a design for the 2nd "it's All About the Purple" afghan for the dance studio. I made an afghan from a published pattern last year, donated it to the dance studio, and we raffled it off. It brought in about $350! This year I was going to make the "second in a series" and I'm thinking it would be fun if this were my own design. I'm also thinking Tunisian. You're not really surprised, are you? Maybe tomorrow I'll look online and at catalogs - Mary Maxim, Herrschners, and think about color possibilities. I took a short break after completing the portfolio for the Basic Stitches. I spent 2 evenings at the dance studio sewing costumes for the competition, end of May, and the recital, at the end of June. Today, I crocheted 3 dishclothes to get a little ahead for the dishcloth exchange. Things will be getting busier at the dance studio, working extra days before the recital. Oldest daughter is coming home next weekend, after 6 months in San Diego. I will have both my girls home for about 6 weeks, and then they go galivanting again. So will enjoy spending time with them while I can. I almost forgot, I also started a new baby shawl for the shawl ministry. It is being made with white baby boucle. I'm actually working it in Tunisian double crochet while frogging the yarn off a shawl I started in Tunisian knit stitch. This yarn works up a little too heavy for a shawl in the knit stitch, however, I'll keep it mind for an afghan for someone's whose little one is due in winter. It is lovely, and soft! Basic Stitches Course is complete! Today I typed the answers to the last few questions, and blocked a thread swatch. I printed a cover for the 2 binders, and side panel with name of course, my name, etc. Tomorrow I will go to the post office and get this mailed out. The course was a great experience, I highly recommend it. I thought that I read that there were 3 levels to the CGOA Masters Program, but I only found 2 courses - Basics Stitches in Yarn and Basic Stitches in Thread. Several years ago I would have taken the thread courses and really enjoyed it, but my fingers just aren't up to that much fine work. A doily or bookmark now and then in #10 and a # 7 hook is okay, but a portfolio of items in #10, 20 and 30, with hooks down to #14, not at this time. I would really enjoy doing a Beyond the Basics, with more advanced stitch combinations, and a course that included other techniques such as Broomstick lace, Entrelac, and Tunisian. Today I went to the Ben Franklin to see how the store closing sale was going. Almost everything has been sold, there is still a lot of fabric, I should check that out. The yarn is now at 70% off!! There is not a lot of choice left, but several things that I was contemplating are still available. Today I bought some Cadiz, it's cotton/acrylic/rayon in a blue variegated. I think it's sportweight, and has a sparkle. I'm thinking a sleeveless vest, good for spring, summer and fall. I think it has a potential to dress it up, or dress it down. Now, am I still thinking about that Berocco Cliche? They have the blue I like! I'm making great progress on the swatches for the Basic Stitches course. Finished 2 more today. I also typed up a pattern, and most of the answers for the questions. I think I might be able to finish up tomorrow or Tuesday. The course is coming along at a steady pace. Today I finished 6 swatches!, I think that makes a total of 13. And today is Friday the 13th! As each swatch is finished I work in the yarn ends, write the label and attach it, slip the swatch into a page protector and add it to the binder. I've started working on the paperwork that accompanies the swatches, also. Need to get back to work on the summer purse I started. It's being worked with 5 strands of # 3 crochet cotton. They sure do tangle while I'm working, wish I could come up with a way to keep them separate. Youngest daughter is home from college. I cleaned all the yarn and crochet projects out of her bedroom. Of course, the only place I had to move it into was her sister's room! She comes home in two weeks! Where am I going to move the stash? Need to get sewing & crocheting projects moved out of the living room also. Can you tell that our house has no family room, or craft room? We had talked about moving both girls into one room, since they're home such a short part of the year, but even if they're not home, a lot of their belongings are!!! My dream house has a large library with comfy couches and chairs, with afghans; right off the master bedroom. It will also have a fiber/craft room with bookshelves, storage for yarn and patterns, computer with all the accessories. I received the instructions for my Basic Stitches course today. I have to make 21 swatches and answer 18 questions. I have a year to complete the course. Looks like it will be a breeze. Today, I went shopping with my daughter, tutored, worked at the dance studio, and made the first 2 swatches. 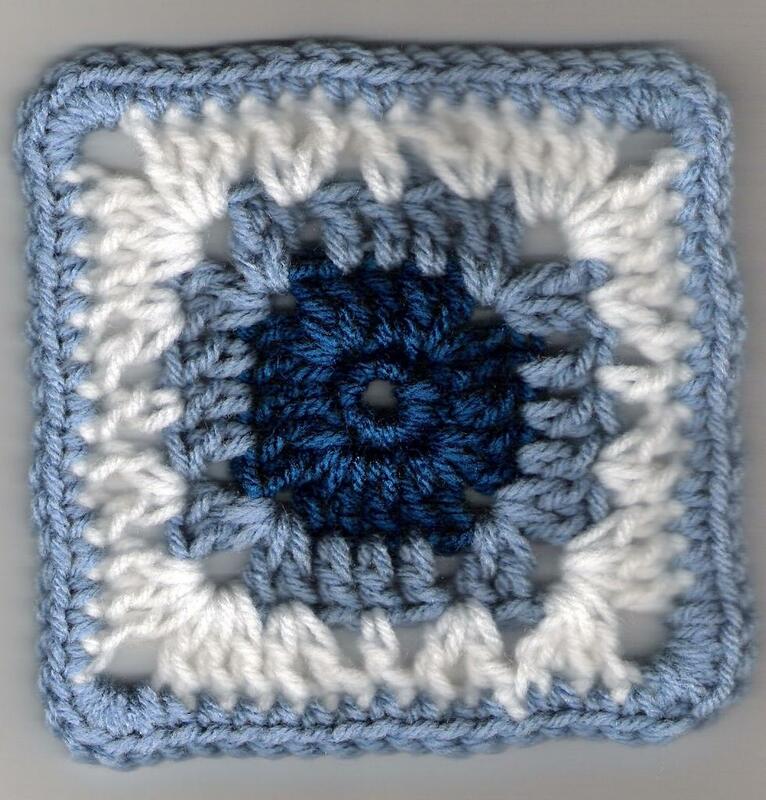 I realize that I've been doing a lot of crochet related things and not finding time to add anything to the blog. CGOA Associate Professional - I am now an Associate Professional member of the Crochet Guild of America. That means I'm working toward professional status. I've been reading the message board, there is a wealth of information in this group! 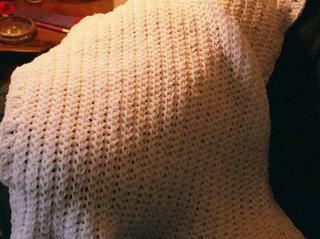 Shawls - I finished another baby shawl in white TLC Amore. Took both to the May meeting of the shawl ministry. This was another of my own designs. I don't know if I'll publish either of these. If I have them printed nicely with a picture, I can use them as part of my classes. I will probably use some of my scarf designs for class, also. New Yarn aquisitions - not too many, I'm running out of space! I did buy 3 skeins of Homespun today while shopping with my youngest daughter (she came home from college Sunday). The Homespun is called Lemondade, and is a sunny yellow, it just looked so summery. I need some lighter colors to work with for a while.